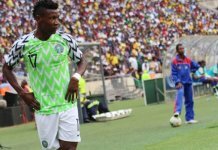 Home-based Super Eaglesâ€™ quest for appearance in the finals of the African Nations Championship (CHAN) suffered a setback yesterday as Squirrels of Benin recorded a surprise 1-0 win over Nigeria in Cotonou. It was the first leg of the qualifying match to the main competition next year. The West Zone B first-leg encounter was played at the Stade de l’AmitiÃ© in the capital city of Benin, Cotonou. According to reports, the home side and the Super Eagles tried to settle down to dictate pace of the game in the first 15 minutes of the encounter. Nigerian defender, Orji Kalu Okogbue,Â was the first player to be booked in the 20th minute as the visitors fought for possession. Then Yarou Nabil had a chance to put Benin into the lead four minutes later, but his header went wide from close range. It was end-to-end stuff as Kingsley Eduwo went close for Super EaglesÂ two minutes later, but he was denied by Benin goalkeeper Steve Glodjinon. However, the two sides were unable to break the deadlock and the score was 0-0 at the half-time break. In the first quarter after interval, coach Salisu Yusuf introduced Stephen Odey for fellow striker Thomas Zenke in an effort to add bite into the team’s attack and it was in the quest for opener that Edumo’s well-taken strike was deflected out for a corner-kick in the 66th minute following some good work by Osas Okoro. 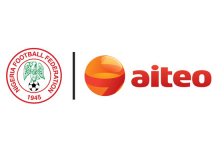 With the match almost looking like a stalemate, the Squirrels were then awarded a late penalty when Hafiz Aremu brought down a Beninoise player in the Super Eagles’ vital area and Mama Seibou then stepped forward to hit the back of the net in the 89th minute, and Benin ran out 1-0 winners. The return leg will come up onÂ Saturday 19th August, 2017Â at the Sani Abacha Stadium in Kano. The Nigerian team needs to score two goals without conceding any to be assured of a place in the finals of the competition in Kenya next year.